Richard Jago was an 18th century English poet, landscape gardener and clergyman. He could not be described as a great poet but his work was certainly appreciated by many, and often imitated. He was born on the 1st October 1715 in a small Warwickshire village called Beaudesert, not too far from Stratford-on-Avon. His father was the rector of the local church and Richard was sent to Solihull School to be educated. He is still remembered there, with one of the school’s five houses bearing his name. He forged a lifelong friendship with William Shenstone who, like Richard, would grow up to be a poet and landscape gardener. The two friends went to University College, Oxford in 1732 and soon fell in with other students with literary talent. Jago decided to follow his father into the church, taking up a curacy in Snitterfield a year before he got his Masters’ degree in the summer of 1738. He was married at the age of 29 but his wife died seven years later, leaving him with seven young children. He somehow survived and became comfortably off as various aristocratic patrons of his poetry offered him the “living” of a series of residences, although Snitterfield remained his favourite place and he eventually died there. Aided by his friend Shenstone, Jago made a number of improvements to the gardens at his Snitterfield vicarage while, at the same time writing poetry and seeking out the company of fellow literary figures such as William Somervile and Henrietta Knight, the Lady Luxborough. His earliest published work took the form of sermons, one of which was for a funeral and he called this one The nature and grounds of a Christian’s happiness in and after death. It was published in 1763. He wrote a number of poems about birds such as goldfinches and swallows and one called The Blackbirds appeared in an anthology published by Robert Dodsley. His love of the natural world inspired many others in a similar vein and, soon, other poets such as James Graeme (The Linnet) and Samuel Jackson Pratt (The Partridges, an elegy) followed suit in the early 1770s. Although Jago’s poetic output was relatively small it should certainly be recorded that he had a considerable influence on other writers, both in his lifetime and the years that followed. Many admired his work, and many imitated his style. 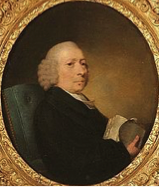 Richard Jago died on the 8th May 1781 at the age of 65.